Bangs can have a huge impact on a women’s hairstyle. When done right, they enhance a style; when done badly or the wrong type of bangs is chosen, it can be very bad. If you’re getting a cut with bangs, you’d be well served to become knowledge about the different types of bangs and also figure out which type is a good fit for your face shape, hair type and length. We can help. 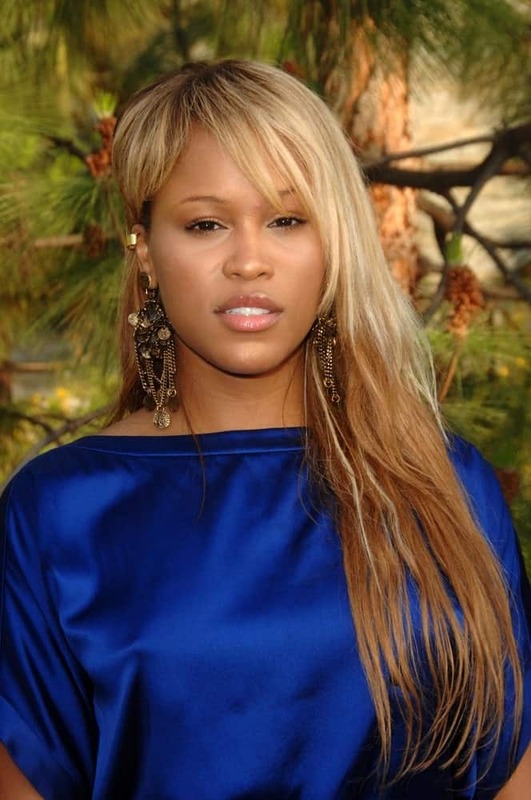 Below is access to our gallery featuring many hairstyles with bangs. Be sure to drill down with other search features. Below our gallery we set out many types of bangs. Thick eyelash-skimming bangs are Zoeey Deschanel’s signature look. The beautiful actress has been rocking the look since “New Girl” began and since then, she is hardly seen without her iconic hairstyle. Her chin-length bob cut and a straight fringe gave Katie Holmes a fresh, new look. Make sure your hair is frizz free and glossy to pull off this wonderful hairstyle. Side swept bangs are all the rage, these days. Not only can they be styled in several different ways — they can be pulled back, combed down or swept down the sides — they are also extremely elegant and chic and are great for both formal and casual looks. You can barely recognize Khaleesi with a fringe. The actress pulled her hair up in a messy updo which put all the emphasis on her long blonde side-swept bangs. The added bangs gives her an elegant look. This look is great for those who have super-straight long hair but adventurous people can try it with their short hair as well. The eyebrow-touching bangs are cut in straight jags and then separated. The straight cut brings out more focus to the eyes and cheekbones. Jane Fonda has sported this super-cool vintage look since the 1960s. It still works for her. To give this look a bit of a modern update, go for a side part and sweep the hair gently to the side. Zendaya is a major revolutionary in Hollywood when it comes to hairstyles. People with curly hair, take note: You can have crimps and fringe at the same time. Just follow Zendaya’s example. Keep your hair longer in the front if you want to have some cool-looking bangs. Ruby Rose’s pixie cut is super short from the sides and the back, but has lots of length and volume in the front. Style the top and front part of your hair in ruffled feathery bangs. Add some highlights to make your hair the star of the show. 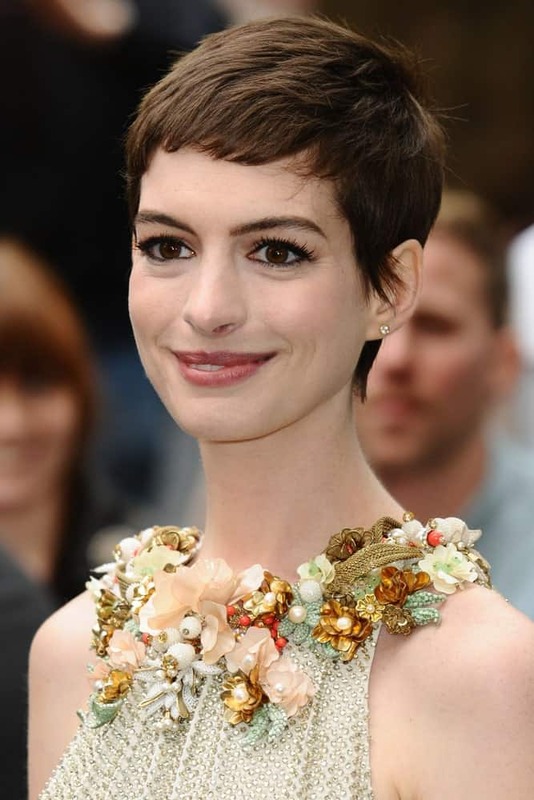 Keep things cool and casual with short baby bird bangs like Anne Hathaway. The great thing about this hairstyle is that it needs minimum maintenance and styling. So if you are a no-fuss kind of girl, this is the perfect hairstyle for you. The style was first iconized by Brigitte Bardot. Not surprisingly, it is still a huge fashion trend these days. Ask your stylist to give you some medium length layered bangs that you can part from the middle. The bangs will frame your face like a curtain. This is a really great volumizing look and is perfect for hair with some texture. Make some messy waves and casually sweep your hair to the side. Spray on some product to make it stay in place. To add some drama to your classic bangs, blow them out and frame them with some errant wisps of longer hair, just like Felicity Jones. To bring focus to your bangs, pull your hair back in an updo. 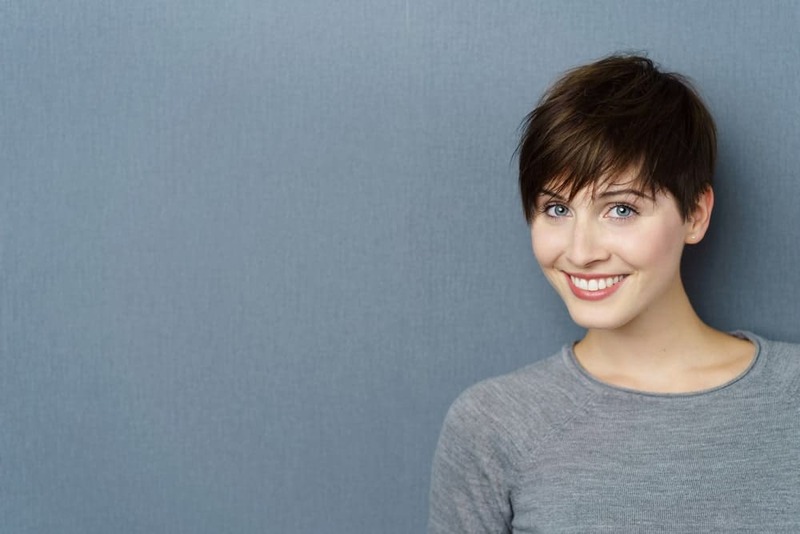 Another great style with a pixie cut, this requires long locks in the front, while keeping the sides and back short in a classic pixie. Sweep your hair to the side and use pomade to add some texture and create soft, natural looking spikes from your bangs. Uneven and choppy bangs are very trendy these days. Ask your stylist to give your hair an edgy, choppy cut with medium length and long layers on the front and side, respectively. Tie your hair back in a cool ponytail like Kerry Washington for an effortless look. 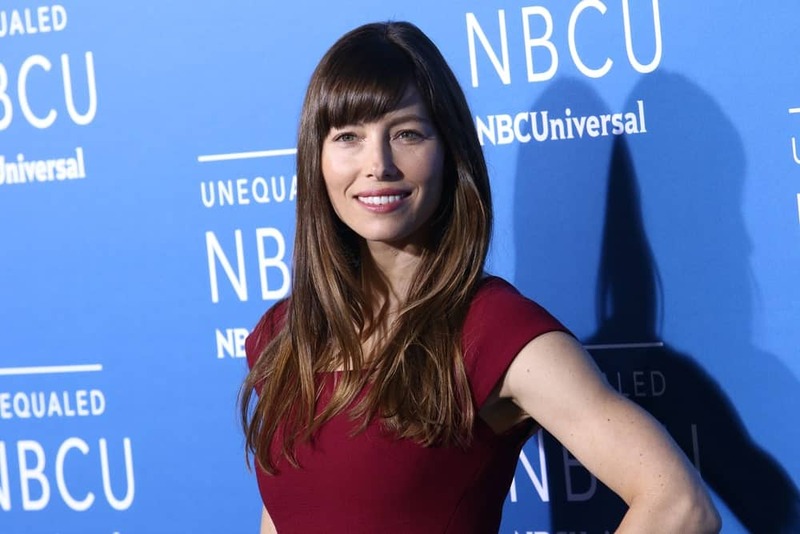 There is nothing quite as appealing as Jessica Biel’s thick fringe and long, straight hair framing her perfectly oval face. The actress loves to trim her caramel colored bangs to her eyebrows so that her light eyes can pop out more. Thin, wispy bangs can give your face a softer look. Just ask Halle Berry. The actress pulled up her pin straight hair in a chic bun but let loose some thin wisps of hair around her forehead and cheekbones. This is a great style to accentuate one’s jaw and cheek line. The great thing about the shaggy look is that it provides a lot of volume, even with thin hair. The shag look is achieved by giving lots of layers to the hair. You can also give yourself a thick, full, feathery fringe that frames your eyes, just like Taylor Swift did. Super straight, blunt bangs can look like a dream with layered hair. Take a look at Taylor Swift’s style that features eyebrow-skimming fringe that transition to longer bangs near her cheekbones. Her hair also has shoulder length layers that gradually became longer to reach her back. 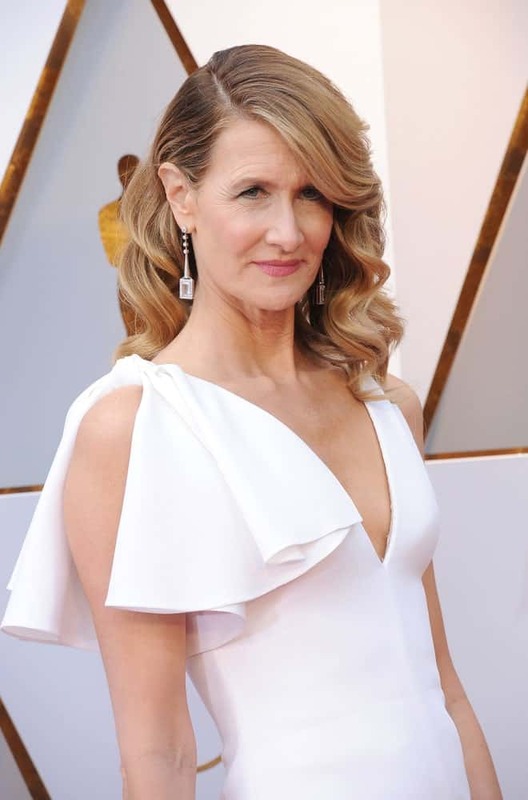 For a super classy and formal look, curls your hair back to the side, like Laura Dern did. The elegant actress gave her hair a dark gold color and gave it some glossy curls. To get the look, blow-dry your curled hair to the side and hold it with some spray. One of the best ways to play with your naturally curly, tousled hair is to give them some fabulous bangs. To add some more oomph, give the bangs an angled cut. This look is great on shoulder-length hair, like this model is sporting. If you have a layered haircut, you can create your bangs to suit the occasion. As Kirsten Dunst demonstrates, pull your hair back in a tight updo and swoop your longer front layer to the side of your face for a dramatic and posh effect. This removes the severity of the bun and gives a volumizing effect to your hair. Want a pixie hair cut but love bangs too? You can have both. Just ask your stylist to let the front of your hair grow out, but keep the hair on the sides and the back short. You can even ask them to give your bangs a jagged cut. Pull the bangs down and ruffle them up for a natural, casual look. 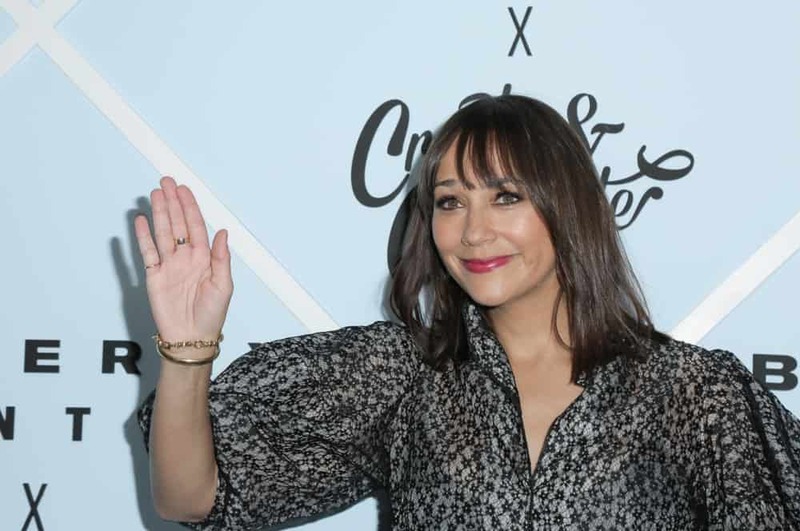 Thin down your fringe to get airy- separated bangs like Rashida Jones. You can ask your stylist to keep them a little shorter, if you like, but having longer eye-skimming bangs means that you can play with them. Sweep them to the side if you like or pin them up if you think they are being pesky. The beauty icon, Angelina Jolie, always hit the red carpet dressed to stun. To get her look, pull your hair back in a subtle bouffant and tie it in a half bun. Ask your stylist to give you feathery, angled bangs and then sweep them to the side of the forehead, like Jolie, for a truly elegant look. Super short baby bangs are not for everyone. Sometimes, they can make a round face appear even fuller. But for people with oval faces, like Emma Watson, this is the kind of fringe you want if you want to keep hair off your face. Jennifer Lopez has one of the most versatile faces in the industry. The actress looks great in whatever she wears, hairstyle no exception. To copy the look, keep your front bangs light, airy and straight. Style your locks into long, flowing beachy waves. Rock you pixie haircut like Miley Cyrus. Shave your sides to a buzz cut, while keeping your back, top and front hair longer. Ask your stylist to give you wispy irregular bangs. Adding some highlight to your hair will also give it some added dimensions. A choppy lob results in a great and effortless hairstyle. Tell your hairstylist to keep your bangs medium-length so that they don’t get into your eyes. Cut your hair an inch or two above your shoulders and give it some choppy, uneven layers. If you have long, straight and sleek hair, this is the look to go for. 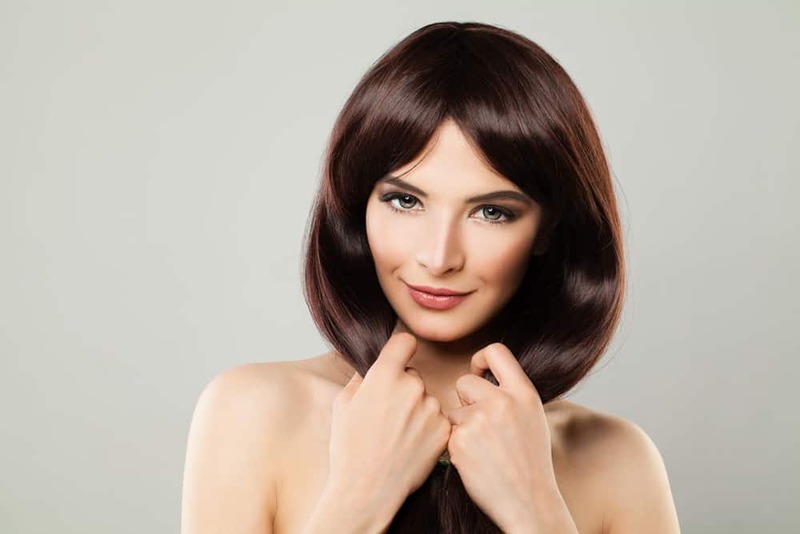 Style your hair with some thin and long bangs that reach your eyelashes. Give your hair an asymmetrical part and keep it straight and sleek with minimal use of product. This is one of the most classic hairstyles for shoulder length hair. Jennifer Aniston’s hair is given layers for a volumizing look. Her chin length bangs have been swept to the side to almost cover one eye for an elegant, posh look. If you want this type of super-dramatic hair, be ready for frequent trims and lots of maintenance. The great thing about the blunt bang style is that they stop well above the eyes and are perfect for hiding a large forehead. 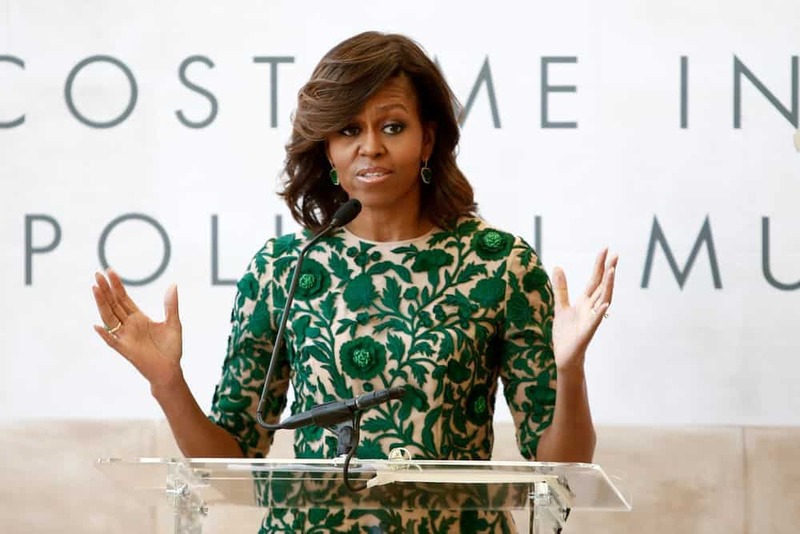 The ever-elegant former first lady shows you how to keep your bangs curled back and elegant. Get your stylist to give your hair some loose curls, like Michelle. Make a deep side part and curls the hair to the side with a curling comb. Nothing defines cute and adorable than this short bob and bangs style that Emma Stone is wearing. The actress’s hair reaches a couple of inch beneath her chin and curl slightly inwards in a classic bob style. Stone has paired the look with some side-swept bangs that enhances the cuteness factor. Here’s how you can take your classic French twist to a new level — give it some long loose bangs. Style your hair in a French twist or a half updo, like Rachel McAdams. Then pull out some long strands of hair from the front and the side for a messy look. 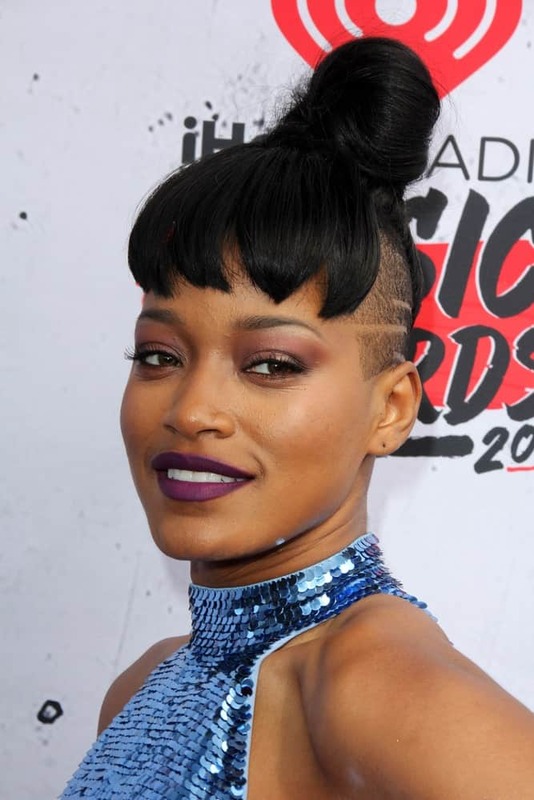 Keke Palmer is known for pulling off risqué looks. Her cool new hairstyle is achieved by shaving the sides of her head. The top and back part of the hair is pulled into a tight ballerina bun but the front part of her hair comprises of thick and pointed-cut bangs. The best things about bangs are that they come in a multitude of styles. So, it is almost impossible not to find at least one style that will flatter your face shape. Bangs never go out of style. Whether you sport a trimmed pixie look or have beautiful locks flowing down your back, bangs never fail to add a graceful and elegant touch to your overall appearance. If this sounds too good to be true, scroll down to browse through some of the most stunning long, medium, and short hairstyles with bangs. This hairstyle is the perfect example of long side bangs. Noomi Rapace looks absolutely stunning with her long hair sporting soft lose curls gathered at one side, with bangs completing the look. She can never go wrong with bangs. Here, Zooey sports a lovely, refreshing look with bangs and two ponytails. While the bangs bring focus to her eyes, the ponytails add a charming touch. This hairstyle combines long and short bangs. The hairstyle features long hair, tucked behind the ear on one side and sprawling down the front on the other. The duo of long and short bangs completes the beautiful look. Bella Thorne could not look anymore lovelier than this! She is sporting long hair tied in a pony and heavy front bangs parted in the middle. While the short bangs cover most of the forehead, her face is framed by the chin-length layers. To complete the look, the ponytail is casually thrown to the front on one side. With a slightly disheveled look and long wavy hair, Jennifer Lopez beautifully sports phenomenal side bangs. This hairstyle features volume like none other and is best suited for naturally wavy hair. Don’t confuse this look for short hair! Dianna Agron looks absolutely lovely with her long hair tied at the back in a stylish bun while her bangs cover the forehead. While most other hairstyles involve messy buns, this one keeps all your hair wrapped and nicely tucked in the bun! Sleek long hair with sleek front bangs is an instant hit. Taylor Swift modeled this hairstyle. Note how it draws immediate attention to her eyes! The beauty of this hairstyle lies in its simplicity. Sarah Rafferty sports this amazing no-hassle look. The hairstyle features long hair tied in a bun at the back and long chin-length bangs in the front on one side. Even when slightly tousled, this hairstyle can look absolutely stunning! Taylor Swift knows her bangs! Her hairstyle for long hair with full front bangs is not only ultra-stylish but also easy to set. The hairstyle features full front bangs, covering the forehead and a good old ponytail. if you have these bangs, all you need to do is tie a ponytail and you are good to go. Don’t forget to let loose a few strands of hair! This hairstyle is not about your normal bangs. Karina Smirnoff modeled these short bangs on long hair. Notice how you can clearly see the forehead in between the bangs. Also, the lower part of the long lustrous locks is curled and lay disheveled on the side. Zooey Deschanel is a true advocate of bangs. The hairstyle features bangs with medium-length hair that slightly curve toward the ends. This hairstyle perfectly frames the face and adds a soft touch to the overall look. This one is a classic! Sarah Lancaster dawns a beautiful look with straight medium-length hair and full side bangs. Resulting in an absolutely lovely look, the voluminous hair frames her face perfectly. Feels like tying up your medium-length locks? This is the perfect hairstyle for you! Jen Lilly sports this lovely hairstyle with bangs. 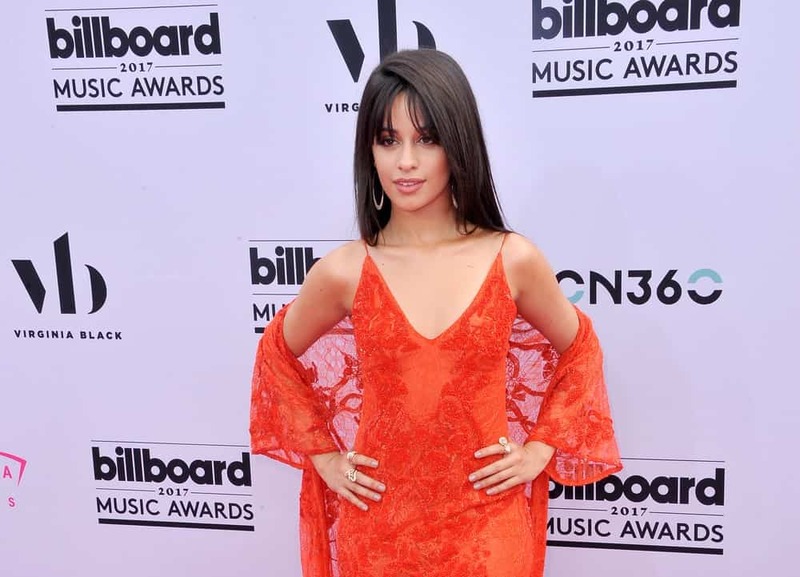 While most of her medium-length hair is tied in a nice bun at the back, a few strands along with the side bangs loosely hang in the front, allowing her face to pop. Just because you have bangs does not mean that you are destined to be wiping hair out of your face and eyes. Modeled by Shirley Manson, this hairstyle features chin-length bangs securely pinned at the side. The end result, as you can see, is adorable. This hairstyle is perfect for everyday routine. It is not only functional and easy to carry but it also takes only a few minutes to attain this lovely look! Who says bangs look great only when your hair is down? Virginia Williams modeled this hairstyle that features a bun and full front bangs. Her medium-length hair is tied secured at the back in a massive bun while her forehead is covered with full heavy bangs. Paris Hilton looks super-stunning with golden glossed curls and a side bang. Note that curving softly in a curl, the side bangs also support the curly texture of the hair. Moreover, the subtle combination of golden-blond and hazel-brown works perfectly to add volume to the hair. 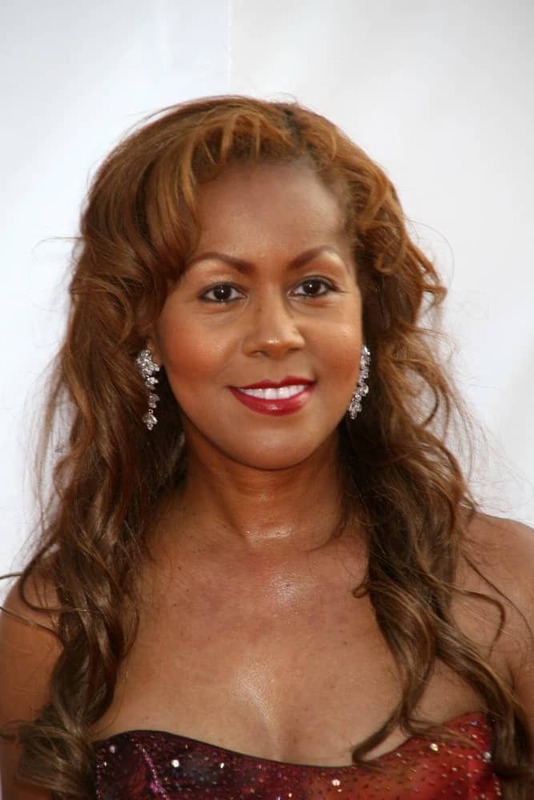 Here’s another hairstyle for medium-length curly hair. If you love your curls, let them hang loosely down your shoulders while a long side bang completes your look! Modeled by Jessica Collins, this hairstyle is a quick fix for medium-length curly hair. If your hair is naturally curly, it won’t take more than a few minutes to set this hairstyle! This hairstyle features long bangs parted in the middle to frame both sides of the face. Modeled by Jenna Elfman, this hairstyle is perfect for women with naturally wavy hair or hair sporting large loose curls. You can let your hair loose or tuck them behind your ear to show off your earrings! 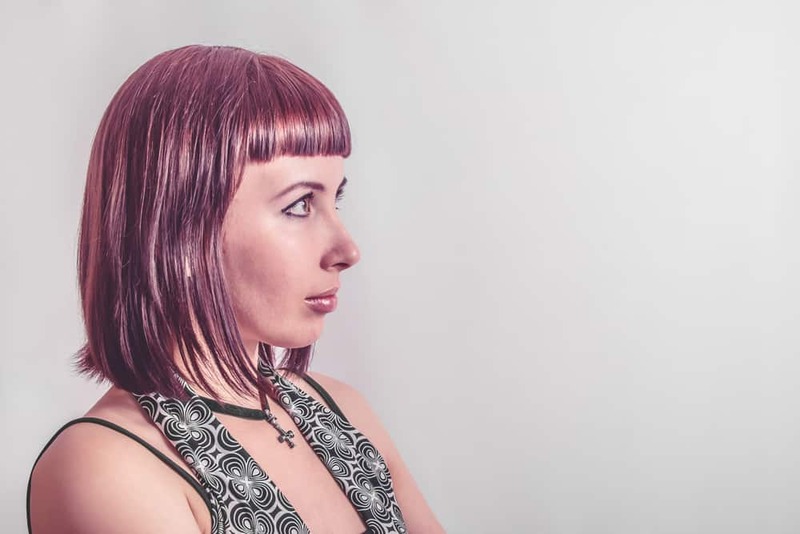 Check out these distinctive looking bangs sported by April Sutton. Unlike most other hairstyles with short bangs, this one does not cover most of the forehead. Instead, the bangs are curved and set on the side of the forehead. Want to show off your eyebrows? Opt for this hairstyle! Here’s another hairstyle to keep your bangs and rest of the hair out of your face. Modeled by Ali Faulkner, the hairstyle involves loosely pinning most of the hair at the back while only a few strands fall freely around the face to frame it. This hairstyle is a synonym to grace and elegance. All you need to balance your short cropped hair is full front bangs. Check out the stunning Kelly Rowland withher short hair and bangs, completing the look with large earrings. Hollywood’s sweetheart, Emma Watson looks stunning sporting short-length hair with side bangs. The hairstyle features short-hair set outwards and side bangs covering half the forehead. Note how the subtle play of color adds that X-factor! With this chic look, the fashionista, Miley Cyrus redefines short hairstyles with bangs. The hairstyle features short hair with one side of the head covered with heavy bangs. Without a doubt, this is one of the best ways to add elegance to short hairstyles. Want to take it a step further? Shave one side of the head to sport short cropped hair and balance it off with elegant bangs covering your forehead. Miley truly pulls off this hairstyle! Can’t find the time to spend a good 30 minutes in front of the mirror every morning? No problem – this messy and casual, yet extremely stylish hairstyle has got your back! 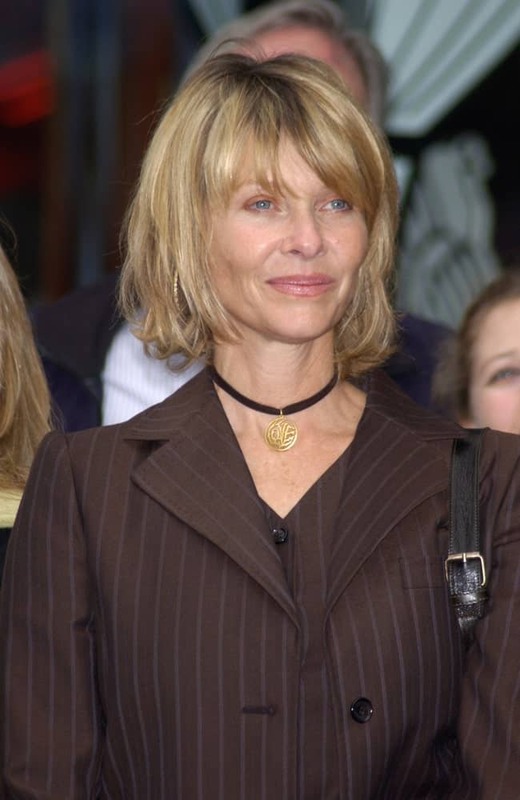 Modeled by Kate Capshaw, the hairstyle is fairly simple. It features chin-length wavy hair and tousled bangs covering the forehead. The hairstyle aims to achieve sophistication through a messy, disheveled look. Bangs and bob is a match in heaven. Check out Angell Conwell sporting a stylish straight bob with side bangs. Go for this hairstyle when you want to bring out your facial features! This out-of-the-bed messy look was brought to the limelight by Kim Basinger. It features tousled layers and loose bangs hanging around the face. The volume that comes with this hairstyle is incredible. This bouncy hairstyle will give you the perfect disheveled look for any event! Feeling nostalgic for the 90s? This short-hair style can give you the 90s feels while enabling you to sport a modern, stylish look at the same time! Ellen Degeneres is the ultimate star when it comes to short hair. 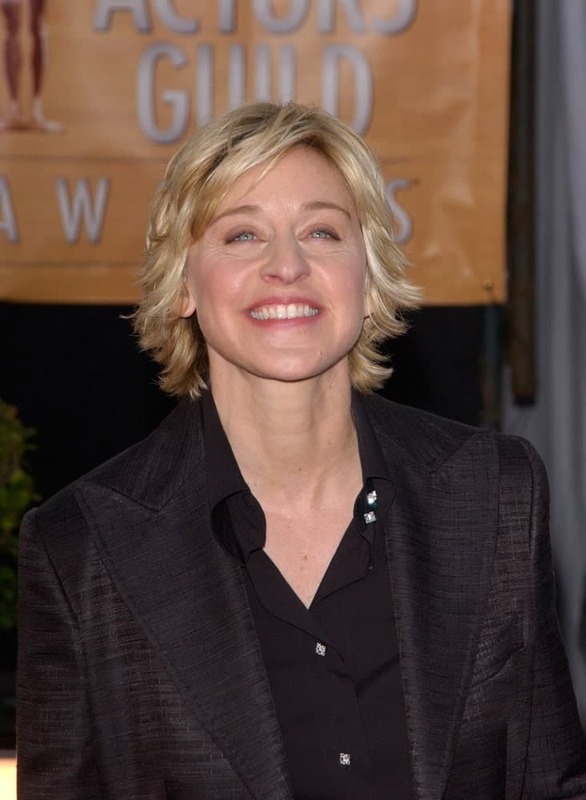 Modeled by the iconic Ellen, this hairstyle with bangs for hair features a feathered hairstyle with side bangs. The layers are set outwards to add texture and volume. To complement the feathered look, her short side bangs cover one side of the forehead, subtly merging in with the layers. Whether you like to keep your hair chopped short or love the long locks, bangs can add an x-factor to every look! Now that you know all these different hairstyles for long, medium, and short hair with bangs, there’s no excuse to not opt for the forever-fashionable bangs. So, which hairstyle are you going to try out first? There are a lot of different types of bangs. Moreover, there are two ways of categorizing bangs. First, they can be categorized in relation to the hairstyle, cut, hair type or length. For example, you can have pixie cut with bangs. Or long hair with bangs. While people search for these types of bangs extensively, they don’t really describe the particular type of bangs pertaining to the bangs themselves. The second way of categorizing bangs pertains the bangs themselves. That’s what we set out below. There are many different options. Long bangs don’t refer to the long hair. It refers to the bangs themselves which are longer than average. These would need to be parted, side-swept, long side bangs or they may be found on the side flowing over the years. Long bangs parted in the center. Technically called curtain bangs but good example of long bangs. Short bangs are dangerous because they can look really odd if cut too short. Bangs must fit with the rest of the hair. Short bangs only really work with certain pixie cuts. Example of a woman with short bangs. Straight bangs drop straight down to above the eye. They don’t curve, sweep or part. They’re like a hair wall dropping down over the forehead. These are bangs cut in a straight, horizontal line. See our full blunt bangs gallery here. Good example of a woman with blunt bangs. Parted bangs are usually parted in the center, but can be asymetrically parted which is a side part. The woman on the left has side-parted bangs and the woman on the right has middle parted bangs. Side-swept bangs can be longer because they sweep to the right or left away from the eyes. It’s an elegant look. See our side-swept bangs photo gallery here. Example of woman with side-swept bangs. Feathered bangs deploy a cut where the bangs are are different lengths (via layers) so when styled you achieve a feathered look. Example of woman with feathered bangs. These are achieved by cutting bangs different lengths which when the hair hangs, it appears to be combed to the side but it’s really not because it’s the different lengths giving that appearance. The wispy areas have gaps in the hair giving it a wispy look. Example of woman with wispy bangs. Deploys a cutting approach to shape the bangs in any number of styles. There are many bangs hairstyles that can be called fringe – it’s essentially a technique shaping the bangs (i.e. hair dropping over forehead). This is when bangs layers are cut different lengths for texture over the forehead. Example of woman with layered bangs. Long side bangs are longer strands of hair the drop down on the sides… longer than the rest or the hair You see this with certain pixie cuts. Example of woman with long side bangs. Curtain bangs are longer and part in the center each side sweeping to the left or right. Example of woman with curtain bangs.